This past Wednesday, Barack Obama proved his political pedigree, unleashing his thus far unforeseen feral side in an historic address to congress upon its autumnal reconvening. All the tell-tell signs were there; the snarl, the unflinching spring-loaded crouch poised to mutilate whatever remains of a National Healthcare debate. It was evident in his tone; combative with overtures of indignation and a sousance of schmaltz. 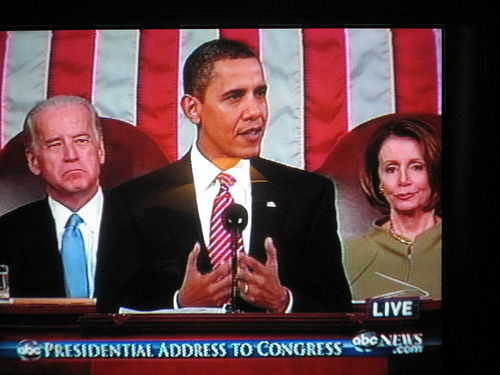 It was, ultimately, this president’s finest speech, as noted by NY Times columnist, David Brooks on PBS soon afterwards — the best since the campaign’s Race Speech. But it was, without argument, overtly and unapologetically political; from the opening salvo, which conjured the independently spirited Teddy Roosevelt, whose anti-establishmentarianism status has gained traction in recent decades, all the way to the shameless grand finale, a tearful tribute to the Left’s late hero, Ted Kennedy. It toed the difficult line between paying backhanded lip service to bipartisanship while ripping the opposition new holes. Mostly it accomplished its only pertinent goal, to galvanize a recently dispirited and fractured Democratic base spewing queer demands on half-baked ultimatums. It was crisp, chock full of luster, and at times a king-hell romp. The problem is it is a speech he should have given three months ago. It is becoming more and more evident by the day that this issue will have to finally be settled in the realm of law and not in the ambivalence of popular opinion or beneath the din of stupidity. The country is fast losing patience with the issue, and the months of incoherence coming from the founders of this movement has left ample room for Myth-Making 101. The president made more than veiled references to this throughout the hour-long address, affecting an anger lost on his first nine months in office. The failure to hit concrete points like the who and how of its bankrolling (made more curious the day after when even prominent Democrats were waiting on number-crunchers to figure how in the world $900 billion over ten years would pay for this thing) was manifest upon a reading of the transcript the next morning. Without the drama and inflection of the performance there seemed to be nothing in the text that answers the key questions, and since the Democrats have no one even close to this guy’s ability to communicate, trouble still brews. Meanwhile, the Republicans are also slowly splitting at the seams. There is the tried and true political animal salivating from The Right refusing to cast a vote for anything that would hand this president a much-needed first term victory, one in which has avoided chief executives for nearly a century. Then there is a growing contingent of moderates and survivalists (political animals all) lead by Maine Senator Olympia Snow, who understands all to well that being on the wrong side of history is not a wise move. If the train has left the station, it is better to not be left on the platform with nary a voice or anyone to bow to. But they have also learned the lessons from the Democrats who voted with fervor for an unpopular and badly conceived war, only to be buried by its abysmal results. This has now become the new administration’s gamble, as Iraq was the last go-round. This time, however, unlike a few poor souls being shipped halfway across the globe on the wave of flimsy excuses, we’re all on the front lines now.